Google chairman Eric Schmidt is heading to the least internet-friendly country on the planet, according to AP, with a forthcoming trip to North Korea on his schedule. Schmidt will be accompanying former New Mexico governor Bill Richardson, who's a repeat visitor to the self-styled "Best Korea". The meeting is a private affair by the two and isn't related to any official government contact. It could, however, be related to the recent arrest of a US citizen of Korean descent who has been convicted of "hostile" acts in Pyongyang – Richardson has brokered prisoner releases before. But what makes the inclusion of Schmidt on the guest list interesting was Tuesday's surprise New Year address from North Korean premier Kim Jong-un. The youthful leader told the citizens of his state paradise that the country would have to focus on building up its technological chops to ensure its future prosperity. "We should bring about a radical turn in the building of an economic giant on the strength of science and technology by fanning the flames of the industrial revolution in the new century," he told his captive audience. "The industrial revolution in the new century is, in essence, a scientific and technological revolution, and breaking through the cutting edge is a shortcut to the building of an economic giant," Kim said. "Like the satellite scientists who conquered outer space we should wage a dynamic campaign to push back the frontiers of science and technology so as to develop the country's overall science and technology to the world standards as soon as possible." Why does that cat look so grumpy? He's got a mountain to climb. North Korea is possibly the most unconnected country on the planet, and what few internet access points it has are heavily controlled, with the penalty for unauthorized access usually being a spell in a reeducation camp. The country is also under a technological embargo from the UN. The contrast with South Korea couldn't be sharper. There the government invested in a fiber network for the nation, and internet use and speeds are some of the highest in the world. 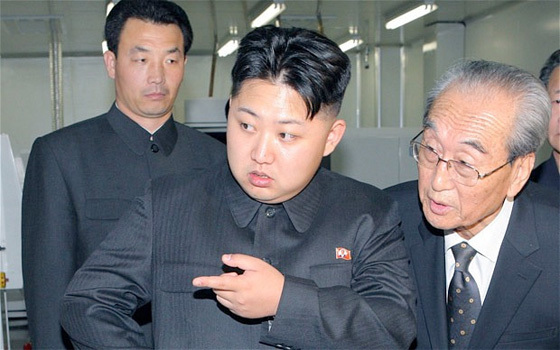 In his New Year address, Kim spoke of reconnecting with the South; doing this online could require very big pipes. But Kim's ascension could be the sign of glasnost in the so-called "hermit kingdom". He's the youngest head of state in the world and may have big ideas for his little country, but he could find that opening his firewall unleashes an unwelcome torrent. Ever since Schmidt stood down from day-to-day operations at Google, he's becoming something of a roving ambassador for global internet issues. It could be that the price of some poor soul's freedom is a session with the man himself, and Schmidt is one of the world's experts on information flows. "The spread of mobile phones and new forms of connectivity offer us the prospect of connecting everybody," Schmidt said in commencement speech at Boston University in May. "When that happens, connectivity can revolutionize every aspect of society: politically, socially, economically."